Living in South Florida, there’s never a dearth of interesting critters. One never knows what shall be encountered while gardening, even. While getting some heavy pruning and weeding done before our approaching tropical storm, I was greeted by a bright green face amid one of our tree’s branches. Not a small guy, either — easily a foot-plus in length! 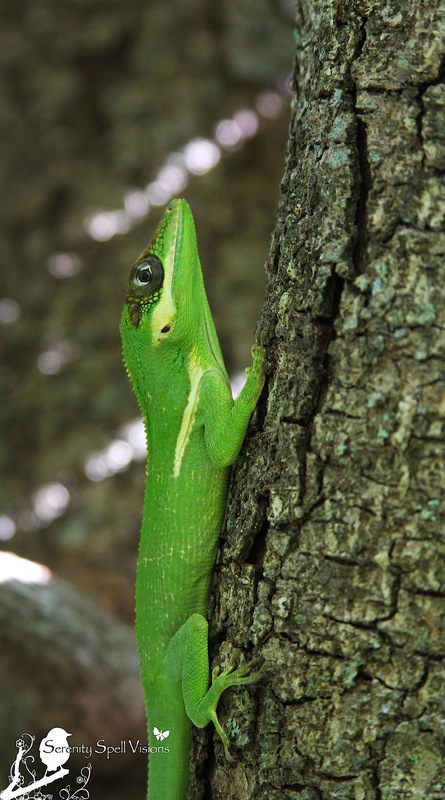 At first, I thought he was a green anole…or a chameleon? I dropped everything, and ran with muddy shoes to fetch my camera to stalk him as he traveled through our trees. Upon further investigation, I now realize he’s a Knight anole, a non-native critter and the largest species of anole — growing up to 13-20 inches in length. 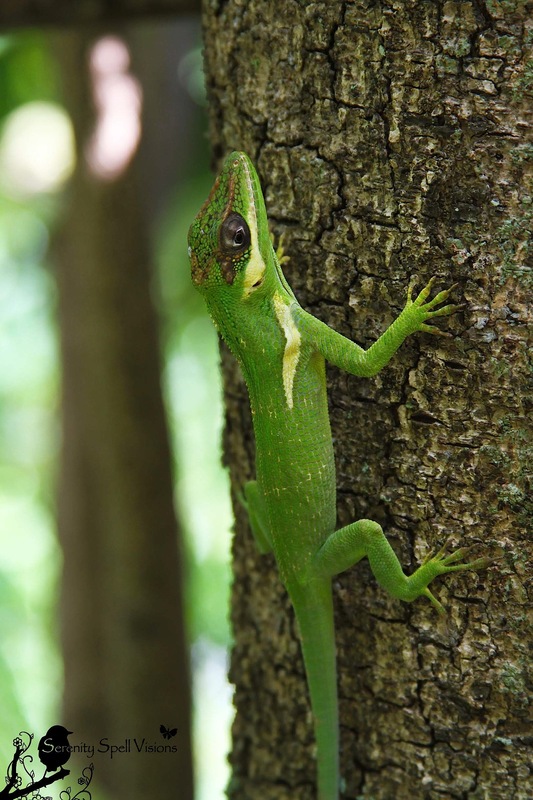 Knight anoles are usually bright green, as seen here, but can change to brown colorations. They sport yellow or white stripes under the eyes and over the shoulder, and the tail is slightly serrated. Introduced from Cuba, they’re becoming increasingly common in South Florida, but will be unable to survive north Florida’s freezes. Most research shows proof of introduction in Dade and Broward, but they’ve obviously made it north, to Palm Beach county…. 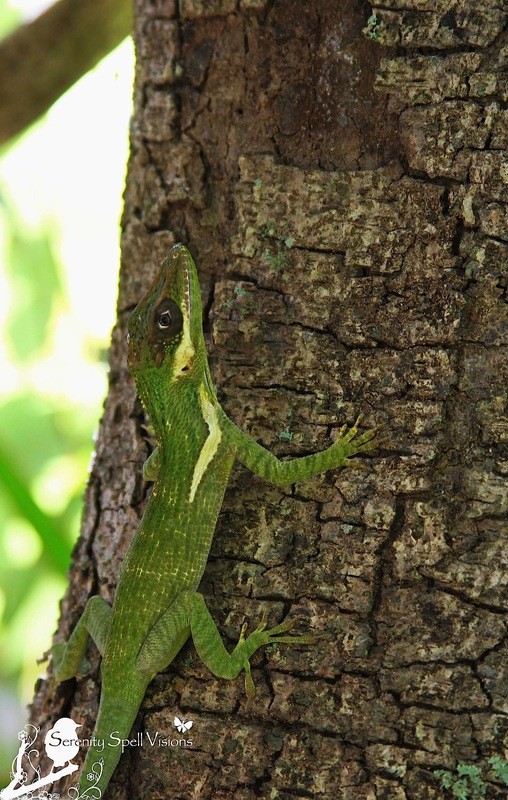 As further evidenced by our guy, these Knight anoles are at home in the higher shady canopies of trees, where they eat insects, other lizards, and even small birds and mammals. Sadly, many of the introduced non-native lizards are eating our native (and smaller) lizards. Give up the ghost. Blend with tree in a failed attempt to hide from camera. Aw, THANKS so very much!! I was thrilled to catch him — I’ve actually seen him on-and-off around the house for several years, now. He’s obviously quite comfy here! Stay safe? Heh Heh … I’m about to head out for a quick six. The windy conditions should ground a number of our high flyers today. Quick six? I don’t know what that is… But in combination with “high flyers” I’m assuming FLYING? Oh no. No way. AH! Now that makes sense! You must be very lucky and live a tad north, where we constantly drive for hiking…? That’s a good exercise-hike, too! Nah … East central county, so my “quick six” is on regular ole suburban sprawl streets. But thanks to our canal system, you can observe our elegant waders pretty much anywhere. Just like you found the Anole in your garden. My development has two nesting pairs of red tailed hawks. A nearby cemetery is chock-full of white and glossy ibis – and a row of trees along the edge that is home for a flock of vultures. For my photo shoots, I drive to the various wetland preserves (north county and south); but there is plenty to see on local walks for those willing to look. BTW, the last time I saw a knight anole it was in Dreher park up by the zoo. He was camera shy and kept the branch between his mug and my camera. Congrats on getting your innocent but unwelcome subject to stay still. Heh, thanks! He’s been a resident here for some time, now (years! )… So I was just thrilled he didn’t bolt while I fetched my camera! We did a 5-hr hike yesterday of the FLA Trail across from Riverbend (I love the trails there), made it into JD by going under 95 (have you taken that route?) into the cypress swamp… Very lovely, but very wet! Jupiter is a bit out of my normal range – but Riverbend and JD are on my bucket list. The eagle was spotted in the east side of Apoxee, but is probably the one whose nest is in GWP. There are so many areas in Jupiter, it would take weeks. Riverbend, JD, Cypress Creek (across Indiantown Rd)… And like what we did yesterday, the FLA Trail in b/w the two. Cypress Creek is new, and just wonderful. Eventually that will connect as well. We spied lots of wild turkey, and a coyote! Very fleeting, sadly. Are you saying the picture is NOT of a bald eagle? I would be devastated – but I know no other raptor that large with a white head, white tail feathers and the large size – easily twice the size of an Osprey. Omigosh I can’t believe I missed him on your Flickr page! MOST definitely a bald eagle!! No denying that shot. We thought we saw one the other day, but couldn’t get another view to confirm the osprey v. eagle sighting (too far, no binoculars, but huge size!). Oh No ! Another wildlife stalker !! Love it, these photos are amazing, and such bright color ! He sounds like a cute little pest though. I would have never heard of the Anole if it wasn’t for you. Beautiful photos. Heeee!!! I didn’t feel badly stalking this guy, since I had seen him for the past few years in the front and back of the house. He’s obviously comfy here! Such amazing color, huh? I was cutting these crazily huge branches, and all of a sudden, I only saw a black-circled eye — he blended perfectly with the leaves. Lovely, but sad that he eats our own Natives. Blech! Wow, he is big! Quite different from the green anole. Nice pics! Thanks so much! Most definitely… I’ve been seeing him around our place for several years now, and I honestly thought he was some kind of chameleon, because of his SIZE. But he looked like a strange anole…! So pretty, but sad that he’s after all our Natives. You are right. I was concerned to read about a new huge lizard that is a threat – the tegu. UGH….! He looks like a monitor, too. They can be fairly territorial and mean. Utterly Adorable! I love lizards! He’s a beauty, isn’t he? And the coloring is just brilliant… Too bad he’s a BIG BABY, bully to our Natives! Thanks so much!! I was thrilled to nab him — he’s actually been a resident around the pad for a few years now… Once we had an actual chameleon. THAT guy was HUGE! Even my Brazilian friend was stunned! Your home place in the world has lots of critters which I have never seen. Much appreciation your information and photos of what’s going on your neighborhood. You’re very welcome — I’m so happy to share this new information with you! This guy, while he’s been living in our space for a few years, is a new critter to me, too. 🙂 And while he’s very lovely (and BIG! ), he’s not very nice to our Natives…. I should keep a sharp eye out for that anole! I’m not so far from you!!! I hope you stay dry and safe during our TS! The winds have really picked up since yesterday in the south…. It actually went through my head… “Who would want this lovely guy?” Unfortunately I don’t know anyone (any longer, at least) who can sufficiently care for reptiles. Otherwise — believe me, I totally would!! At first I was going to say “What a beauty you’ve got there.” but I guess it’s not good that he doesn’t belong here. I hope they don’t start eating all of the lizards. Ah, I agree… He IS a real beauty, and it certainly isn’t his fault he doesn’t belong! It’s sad though that all these non-indigenous guys are eating our smaller native lizards. Aw, you’re so incredibly kind! 🙂 That means a lot. The color of this guy was BRILLIANT. If it weren’t for the black ring around his eyes, I honestly wouldn’t have seen him, for the leaves! He blended perfectly. Couldn’t get much more green. Beautiful photos as usual. Do you jump when you suddenly see an eye staring at you out of the leaves? Honestly, if it weren’t for that black ring around his eyes… I wouldn’t have seen him! I was inches away for several minutes before actually seeing him, hahah! Such wonderful camouflage. Love your enthusiasm… Can see you squealing with glee and running for your camera. Oh, muddy shoes and all! Tripping over cats both ways… No shame! Looks like Sandy is headed your way — be safe. These pictures are breath-taking and I agree with Bashar’s comment that they could go in a magazine like Nat Geo. So crisp! It is a shame about the non-natives destroying the natives..sadly that behavior goes all the way of the food chain doesn’t it? Great post! BTW, this off the wall, but have to ever seen the dolphin Winter from the movie A Dolphins Tale? We saw that movie the other night — now I have her website bookmarked so I can watch the webcam lol. I bet you could take fantastic pictures of her. It really is a shame such a lovely, but non-indigenous critter is a danger to our smaller Natives. It’s a real problem in our area (with many introduced species), especially. I can’t believe I HAVEN’T seen this movie, yet! I fear much bawling will be done — which is why I haven’t seen it. But I know the sanctuary where she lives is on the other coast of FLA! What a story. What wonderful people to help this amazing girl. Your photographs are just amazing. Brilliant! Aw, thanks so very much! Lucky shots, wonderful models, and great timing. 🙂 And loads of patience…. What? What!?! A tropical system? I’ve been traveling for a few days and am up in Kansas City – I’ve not been keeping up with the weather. Maybe I should go look! These photos are stunning. I’m becoming more and more sensitized to the chaos brought to our world by invasive species of any sort. On my way up here, I saw beautiful yellow acquatic flowers lining the banks of the Arkansas River in Oklahoma. I did a bit of research and discovered they’re non-native. And the best autumn color in Texas often comes compliments of our Chinese Tallow trees – invasive. 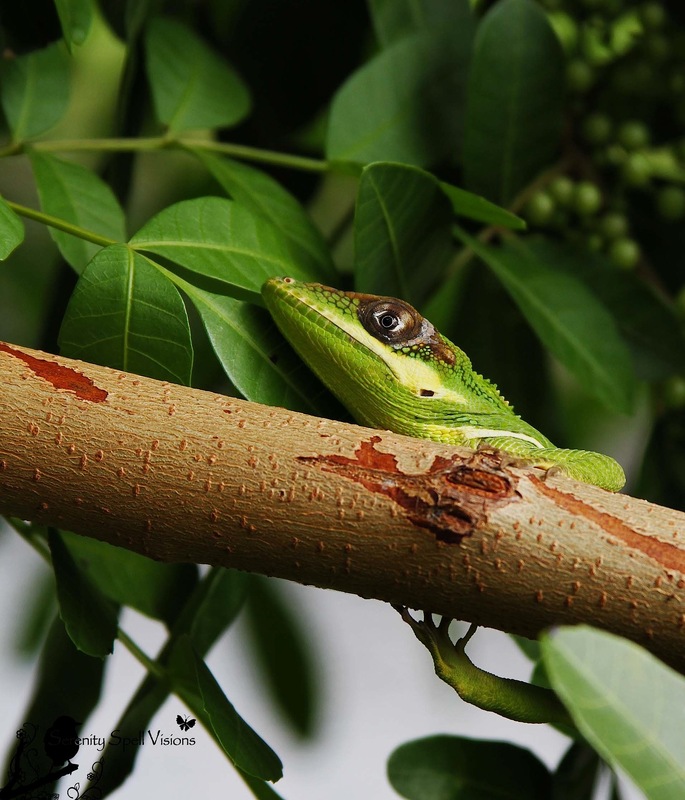 In any event, your anole is wonderful. We have small ones that are delightful. And this surely has been our Summer of the Lizard. I don’t always know what species I’m seeing, but I’m clearly seeing baby lizards. Some are only two inches long – awwwwwww! Hahah! Well, it was Sandy — she swooped up the coast (we’re in SE Fla), and it was HIGH winds and LOTS of rain for our area, obviously… Whooo boy! A solid 2 days of it. Debris city, still! You’re very kind — thanks so much!! It really is true. It’s true of all areas, but southern Florida has a ridiculous amount of invasive critters, due to former lax laws and importing of exotics. Just disgusting that so much could have been prevented. How dangerous are they? I guess a foot long lizard can deliver quite a bite! He’s a handsome beast, great shots. That’s what I was thinking! Well, they can eat small mammals and birds, and can grow up to just under 2 ft long… So I definitely didn’t get TOO close — although I was a few inches away from him. But he was in the sun, so I knew he was moving slow at that *exact* moment. But you’re right — he is a handsome beast! Aw, really? Such an intense green… I would never have even seen him against the leaves, if it weren’t for that ring around his eyes. Thanks so much! This guy is quite the beauty, but being so large — and our Natives so small — he’s a dangerous beauty. What brilliant crisp shots! I know feral species can wreak havoc with local ecosystems but he sure is beautiful. Thanks so much…. And, my thoughts exactly! If I knew someone who was good with reptiles (sadly, I used to) — I would’ve caught him! In case we might forget, in all the day to day worries, and terrible stuff in the news that our Earth is a magical place filled with mystery, life and beauty-we can thank bloggers like feygirl for reminding us with posts like this. It’s easy to get distracted by all the bad news, work to be done etc but making sure to get out into nature and connect with what is REAL is essential. [ Smiles ] You have a lovely blog here; I enjoyed visiting it! NOT A TREE CROCODILE????? THANK YOU FOR THE BEAUTIFUL PICTURES!!! Ah, my knight in green armor. He’s so handsome too. What a find, FeyGirl. That brings a smile to my face because I love all those creatures too, even the ones in spirit. Start out pruning and end up with a beautiful blog post. Nice. Thanks so much! One never knows what to encounter in this area, sometimes… Native or not!